The Affordable, Next Generation in Self-Service Book Scanning Solutions – Great for Public Libraries and Colleges! The Scannx Book Scan Center is the industries most powerful, and easy-to-use self-service book scanning solution for under $5000! Saves time for staff – reliable and easy to use -no training required! Cutting edge technology accelerates research and collaboration for library patrons and staff. Maintain privacy and confidentiality with passwords. Automatically deletes all scanned materials and email addresses after each use. Add enhanced authentication to prevent anonymous emails. 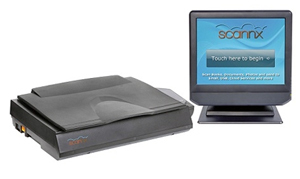 Scannx Book Scanners are the first and only book scanners with cloud based services for tracking usage, enabling/disabling features, and pushing updates from a remote location via internet. Powered by ABBYY FineReader Technology for unmatched accuracy, the Scannx book scanners convert images to searchable PDF and Word files. Email, iPad, iPhone/smart phone, Google Drive, SkyDrive, USB, Fax, Printer, OCLC/Article Exchange, ILLiad and Odyssey.